"For a few hours you can become a completely different person living a completely different life"
"For a few hours you can become a completely different person living a completely different life, making decisions you'd never make and forgetting what's happening in the real world. "It's liberating." The likes of Dungeons & Dragons - in which players devise characters such as elves, wizards and warlocks through role play - have long been thought of as niche, nostalgic, nerdy, or a combination of all three. But in recent years, tabletop gaming has enjoyed something of a revival - in part due to the popularity of fantasy shows like Game of Thrones and Stranger Things, where the child heroes are seen playing the game in the show's first episode.And with celebrities like Drew Barrymore, Vin Diesel and Dwayne "The Rock" Johnson coming out as fans, it seems so-called geek culture has come from behind closed doors and into the open.BrewDog's duty manager Jacob Soppelsa says it was a no-brainer to mix the once-maligned storytelling adventures with the popular world of IPAs and imperial stouts. "I discovered [Dungeons & Dragons] when I was old enough to drink, so I've always associated the two," says the 24-year-old. "I think it's quite well-suited to playing in bars and pubs; it's all about hanging out with your friends and telling stories. "It's especially good doing it in places that have beer - people tend to loosen up a lot. It's super-social, not anti-social. "When you have been in a story with people you've never met before you feel like you're old friends, because you're all working together." It's not just BrewDog jumping on the board game bandwagon. Across the UK, dedicated games cafes are popping up, while at other establishments, themed nights bring old and new fans together. "One of the interesting things about tabletop games and other 'analogue games' is they've always been popular, but they're definitely more visible in popular culture today," says Prof James Newman, film lecturer at Bath Spa University. "There are board game groups that meet to play and discuss games like a book group would, and board game cafes which, again, are highly social as well as functioning like libraries where people can try out new games. "And that's an important point. There is potentially something appealing about the limitations of board games. Their altogether more symbolic and iconic pieces and counters mean you have to imaginatively fill in the gaps." 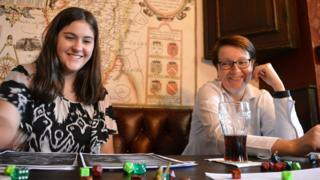 The social and creative aspect brings one group together at Ye Olde Trip to Jerusalem in Nottingham every Wednesday to play a variety of games, such as fantasy-flavoured Dark Heresy, tongue-in-cheek Dead Teenagers, and Achtung! Cthulhu, a tabletop game mixing World War Two history with the lurid lore and gore of science fiction writer HP Lovecraft.For Kendra Hourd, it has been a way back into the games she used to play in her teens. "Everybody kind of got married and had kids, so I was left without a group for some years," says the 46-year-old. "But then I found other people and got a group again [and it was] easy to bring people in and get them involved. "One of the things I love about it is I can have very geeky conversations with my friends about anything." "I'm not a geek, I'm a nerd," interjects Sean Colluney, 53, the games master for the evening, who directs the adventurers along their quest. A veteran Dungeons & Dragons player, he pores over World War Two trivia to give his Achtung! Cthulhu scenarios a sound historical basis. "Sooner or later with Cthulhu everyone knows their character will go insane or die," he explains. "In Dungeons & Dragons, your character can go on and on for years, but it's a similar principle: you develop your characters and help each other. "I like being the games master - I like running it, I like watching people react and seeing their thought processes; it's fun to see people talk among themselves [as they're] working out what's going on." Relatively new to tabletop gaming is Mario Civico, who "fell in love" with Dungeons & Dragons after learning about it through a colleague.At BrewDog, the 27-year-old is revelling in his role as regular dungeon master (DM) - the person in charge of the rules and narrative of each campaign. "Storytelling is a massive thing for me, and when I started as a DM I realised I was more creative than I thought," he says. "I like building a whole world and watching it play out - I like seeing how people interact with it." Ian Livingstone, co-founder of the company, says the rise in popularity of video games from niche pastime to central family entertainment has had a knock-on effect for the world of tabletop gaming. "Video games used to be seen as the preserve of teenage boys in their bedrooms. But games consoles have come into the living room, mobile phones all have games, and it's become a lot more socially acceptable to play games [generally]. "They are compelling because they're interactive - they put you in charge of the action. TV and film are passive, but with games you're in charge of what happens. "They resonate with a lot of people because they enjoy making the decisions." There's no denying that tabletop gaming has lifelong fans eager to tap into their childhood memories. But has it truly shed its terminally uncool image and attracted a new wave of gamers"But it's not as nerdy as I thought. And now, being nerdy and being into board games or fantasy isn't a bad thing. "It might still be perceived as weird, but I don't care." Bulwell-based Mantic Games, which uses lead alloys to make the figurines, is mere miles from Games Workshop's headquarters in the Lenton area of Nottingham.It moved from London in 1997 and boasts a dedicated gaming room and Warhammer-themed pub, while others such as Foundry, Perry Miniatures, Theme 17 and Warlord are all nestled in and around Robin Hood's home turf.Their close proximity has earned the area a nickname - the Lead Belt - and become something of a destination for tourists and gamers alike. "We had a bloke from America who was going to India with work, and when he was offered a stopover he said he wanted to go to London," says Rob Burman, sales and social media manager for the firm. "They said to him 'Oh, are you going to see St Paul's Cathedral or Buckingham Palace?' and he said 'No, I'm going to Nottingham'. "His mates thought he was mad, but we were happy to give him the tour and show him how it's all made."